Prize Fighter Stacking Ring. Sterling silver boxing glove ring. Strong female jewelry. Fierce female feminist ring. Welcome to Miss November Studio! I specialize in dainty feminine personalized jewelry for the discerning jewelry lover. This listing is for a tiny sterling silver boxing glove stacking ring. Make a stack! Add a custom stamped band and two gemstone bands with stones like a bruise worthy labradorite and bloody garnet to inspire you to fight on! Stacking rings are excellent accessories, not to mention fun to collect and wear. One ring worn alone is dainty, two is quaint, but a loaded stack is a statement! I love to mix and match my stacking rings. I mix metals and make different stacker themes. Occasionally I wear a single stacking ring with a mantra or a word of encouragement to meditate on. Please note that if you plan on wearing more than three stacking rings together you may need to size up ¼ size. More than five rings worn together require ¼ to a ½ size increase. The more rings you stack together, the more it compresses your flesh. If you need help determining how much to increase in size please send me a convo, I love to help! Most rings are available for free resizing if I don’t have to cut open and refinish them. All jewelry is packed ready for gifting. Follow me on social media where I post coupon codes, share customer photos, and host giveaways! The Tiniest Peanut Mommy Ring. Sterling silver peanut stacking ring. Push present new mom gift. Expectant mother jewelry. Dainty Sterling Silver Horseshoe Ring. 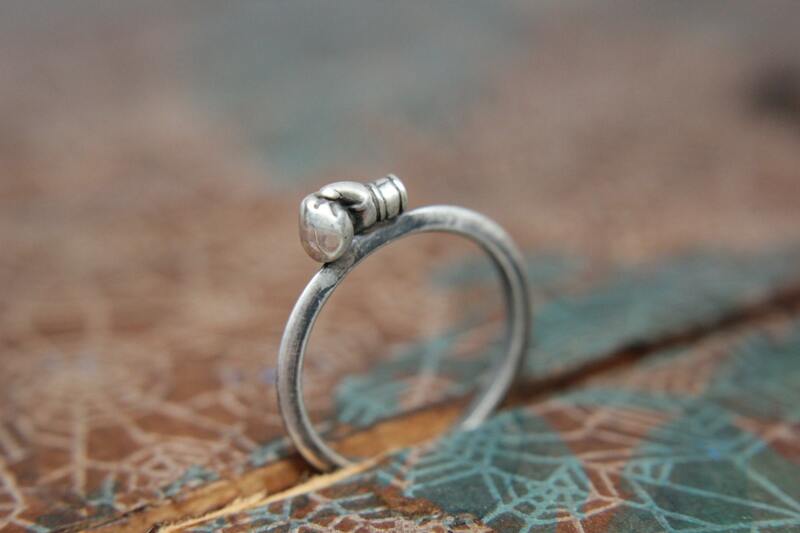 Silver stacking ring. Sterling silver equestrian jewelry. Lucky horseshoe ring. Darling Little Spring Flower Bud Ring. Sterling silver floral stacking ring. Springtime stacking jewelry. Delicate Blooming Poppy Gemstone Ring. Sterling silver floral gemstone stacking ring. Springtime jewelry. Dainty little skull stacking ring. Sterling silver skull ring. Sterling silver skull stacking ring. Arrowhead Stacking Ring. Sterling silver arrowhead ring. Aim straight arrow ring. Triple gemstone stacking band. Three gemstones on a textured ring in sterling silver.